The 2015 Galion NFL Punt, Pass & Kick competition winners were crowned last Saturday at Unckrich Stadium. Back row, left to right, Austin Sherman (Boys 14-15), Sara Goossens (Girls 14-15), Owen Mullins (Boys 12-13) and Hannah Snyder (Girls 12-13). 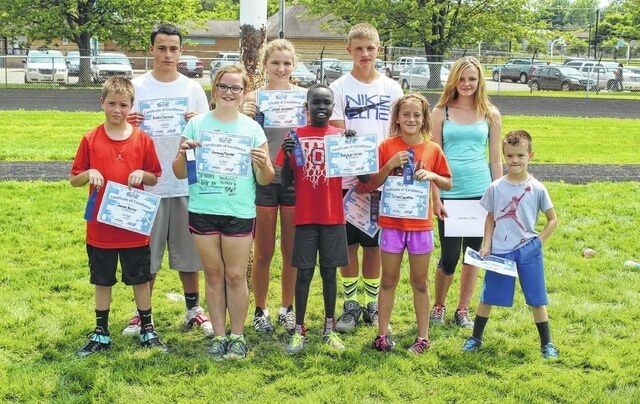 Front row, left to right, Cannon Butler (Boys 10-11), Kennedy Painter (Girls 10-11), Bodpegn Miller (Boys 8-9), Jillian Capretta (Girls 8-9) and Colton Flynn (Boys 6-7). For the first time in more than 20 years, Galion area youngsters had the opportunity to participate in a NFL Punt, Pass and Kick competition. Organizers said 86 local youths registered for the event, which was held Saturday at Unckrich Stadium in conjunction with the revival of the Pickle Run Festival. Capretta, who plans to coach youth football in Galion this fall, participated in punt, pass and kick in his younger years and was glad to be part of the group that revived the event locally. What about future plans for NFL Punt, Pass and Kick in Galion? “We’d love to have it be an annual event and be part of the Pickle Run every year,” Capretta said. The age group winners from Galion will advance to the sectional tournament. The dates and locations for the sectionals have not been released yet. Sectional competitions will be staged in October and November. Team Championships are scheduled for November and December. The National Finals will be held in January at a NFL Divisional Playoff Game, with the site to be determined. NFL Punt, Pass & Kick was established in 1961 and is the oldest NFL Youth Football program. The program is a free event, both for local oragnizers and participants. Capretta said he is looking forward to coaching youth football in Galion this fall. Registration for the 2015 Galion Youth Football season is in progress. The deadline to register is July 14. For information, visit www.galionyouthfootball.com. Registration forms are available on the website.